What has made Tunisia’s transition from authoritarian government, for all its ups and downs, more successful than those of its Arab neighbors? It will soon be four years since December 17, 2010 when Muhammad Bu Azizi from Sidi Bouzid in Tunisia immolated himself in protest against local government officials who barred him from earning a meager living for himself and his family selling vegetables from a cart. That act of ultimate frustration set off protests throughout the Arab world that came to be called “the Arab Spring”. Regime changes took place not just in Tunisia but also in Egypt (indeed, two changes in Egypt since 2011), Libya and Yemen, and a still raging civil war in Syria has cost the lives to date of an estimated 200,000 inhabitants. The last few months have witnessed the rise of the Islamic State in the northern areas of Iraq and Syria. Instead of the hoped for new beginnings bringing democracy and liberation the Arab world today seems to be stepping backward from where it was before December 2010. The one possible exception is the country where the Arab Spring began – Tunisia. Why Tunisia? The specifics of the Tunisian case might be summarized as follows: Ten days after the death of Bu Azizi President Zine al Abdin Bin Ali fled the country ending up in Saudi Arabia. Thus ended his twenty-four years rule. Ended as well was Tunisia’s single-party rule that had held sway since independence in 1956, first under Habib Bourguiba and thereafter Bin Ali. An interim government led first by the man who had served as prime minister since 1999 was replaced after roughly a month by Beji Caid el Sebsi who had held many posts during the Bourguiba/Bin Ali era but came out of retirement to serve throughout the remainder of 2011. He was later to create the principal secular opposition party, Nida Tounes. Elections for a Constituent Assembly that would also be charged with drafting a new Constitution were held in October 2011. The moderate Islamist party, Al-Nahda, outstripped all other parties in the October elections and formed a government with two smaller secular parties in what was dubbed the “troika”. Rashid Ghannoushi, who had been leader of the Tunisian Islamists since the 1980s, returned from 22 years of exile in Europe on January 30, 2011. He chose to take no position in the government, remaining head of al-Nahda. Two Nahda leaders served as prime minister from December 2011 until January 2014. and the human rights advocate, medical doctor and founder of one of the secular parties in the troika, Moncef Marzouki, was elected interim president by the Constituent Assembly. This period was fraught with delays and disputes over the constitution and charges by the secular opposition that al-Nahda was packing the bureaucracy with its followers. There was also an attack on the American Embassy led by Salafi extremists in September 2012. The year 2013 also brought more trouble with two political assassinations in Tunisia of leading Leftist political figures in February and July 2013. The Egyptian coup in July 2013 replacing the Muslim Brotherhood government and President Muhammad Morsi with a military-backed government led by General Abd al-Fattah Sisi, soon to become Egypt’s president, intensified the disorder as some Islamists feared and some secularists hoped for a similar development in Tunisia. To break the downward spiral of deadlock and violence four non-party institutions, led by the Tunisian trade union movement assembled a meeting of the government and opposition party leaders in the fall of 2013. Late in the year after many tortuous meetings the Nahda-led governmental coalition agreed to step down to be replaced by a government of non-party technicians. Then in January 2014 a constitution acceptable to both Islamists and secularists was agreed upon. Scheduled for later this month are parliamentary elections to be followed by a presidential election in November. By standards of any revolutionary upheaval, whether Middle Eastern or elsewhere in the world, past or present, Tunisia’s record to date has been positive. Why Tunisia? Tunisia is a small country, slightly larger than our state of Georgia and a bit smaller that Missouri, with no major geographical barriers. It has nothing like the mountain chains that characterize its neighbors to the West, Algeria and Morocco. Nor does it have the extensive desert regions characterizing its Eastern neighbor Libya. What hills and desert areas Tunisia possesses are largely to be found on the Eastern and Southern borders respectively. Geographically cohesive Tunisia can be seen as the gateway by which men, armies and ideas from outside most readily enter the Maghrib. The metropolitan area of Tunis embraces the site of ancient Carthage, and today’s Tunisia was the heartland of Roman Africa (thus the medieval name for Tunisia – Ifriqiyya). In the Islamic period Tunisia became more rapidly and more thoroughly Arabic-speaking than its neighbors. Whereas there are to this day as many as a quarter of the population in both Algeria and Morocco who are native Berber speakers and perhaps 3% in Libya, Tunisia records only an insignificant .3% found in the extreme south of the country. Of course, the entire region West of Egypt is overwhelmingly Sunni Muslim. For Tunisia the estimates are 99% Sunni Muslim. Tunisia has for centuries been ruled by state systems controlling essentially the same territory bounded by present day borders. The Ottomans ruled Tunisia since the mid-sixteenth century, and although the beylik of Tunis was juridically just an Ottoman province those ruling in Tunisia enjoyed considerable de facto autonomy. Moreover, many dynasties based in Tunisia from early in the Islamic period enjoyed state-liked status – the Aghlabids, Fatimids, Zirids and Hafsids. French colonialism in Tunisia (1881-1956) whatever its other faults or virtues always treated Tunisia as a distinctive polity. Tunisia, like Egypt, has boasted for centuries (for Egypt millennia) a continuous run of dynasties ruling over the same territory and people. Tunisia, in short, is a nation state, geographically accessible to its rulers in the capital city. Tunisia is ethnically, religiously and linguistically unified. In addition, the post December 2010 scene in Tunisia produced other developments that provided a less hectic and less bloody revolutionary transition. In the crucial matter of timing, Bin Ali fled from Tunisia on January 14, 2011 whereas Mubarak in Egypt hung on to power, with ever increasing riots and vicious crack-downs, until forced out a full month later. Moreover, the revolutionary change proceeded more slowly in Tunisia. The prime minister who had served since November 1999, and was thus part of the old regime, remained in that post until late February. His replacement, Beji Caid el Sebsi who served until December 24, 2011, had long been a leading official during the Bourguiba/Bin Ali era but had retired a decade earlier in 1991. The divergent role of the military in the several states that mounted, or attempted, revolutionary change was of fundamental importance. In Bahrain, Libya, Syria and Yemen the military was soon engaged. Only in Egypt and Tunisia did the military abstain in those crucial early days from cracking down on the demonstrators, but the apparent similarity of these two cases dissolves on examination. The Egyptian military, as later developments so clearly indicated, was both politically and economically the most important element in the existing state structure. Its leaders deftly managed the revolutionary transition leading to the later coup overthrowing President Muhammad Morsi in July 2013. The Tunisian army was never a part of the Bourguiba/Bin Ali political apparatus. The army commander, to his credit, refused Bin Ali’s request to take on the demonstrators, and the Tunisian army remained solidly off stage thereafter. Another contrast with Egypt is that Tunisia’s al-Nahda Party avoided the appearance of seeking monopoly control. Al-Nahda joined with two small secular parties in order to create its troika. Al-Nahda did not put forward a candidate for president and, instead, supported the candidacy of Moncef Marzouki who won the post. Even so, by 2013 with two political assassinations of leftist leaders the Islamist and secular forces seemed gridlocked. That the breakthrough came via the intervention of non-party organizations led by the Tunisian trade union movement illustrates the effectiveness of organized civil society in Tunisia. There is as well the ever-important but always contingent and unpredictable role of individual leaders to consider. Surely all but those who see no essential difference between moderate Islamism and the most fanatic of jihadis (just as some in earlier generations saw no difference between Stalinists and Social Democrats) can appreciate that Rashid Ghannoushi is, indeed, a democratic Islamist. One can play the “what if” game and speculate what if Ghannoushi had led in Egypt and Morsi in Tunisia. 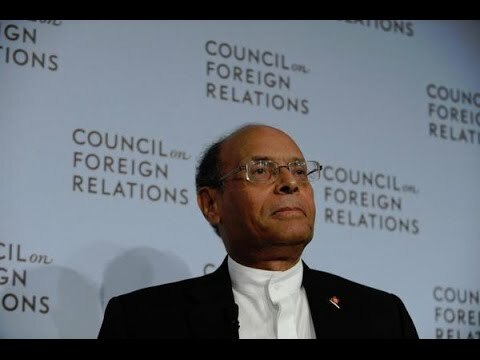 What if Moncef Marzouki had not written so many works, in both Arabic and French, championing the liberal humanitarian ideology. He may be rather like the American Revolution’s Thomas Paine better at ideology than politics, but his role in enunciating the former is impressive. I end on an admittedly speculative and unprovable note: Perhaps the “moderation” of Tunisia’s al-Nahda and its leader is to be explained by reference to the Turkish case. Ataturk pushed through a radical secularization in the 1920s and 1930s, and in classic Hegelian thesis-antithesis-synthesis fashion the Islamic reaction that emerged several decades later adopted a moderate Islamist ideology. So too did Bourguiba’s radical realization of women’s rights and advancement of modern, secular education (among other modernizing and secularizing steps) leave the later emerging synthesis the moderate Islamism of al-Nahda. A final coda: As of this date al-Nahda is not presenting a candidate for the presidential election next month.